Paper quilled jhumka earrings – they have practically taken over the world of quilled jewelry! I have two other tutorials for jhumkas – the basic one with my own twist, and one with beads added to it. It was more than a year ago when I first saw this other style of paper quilled jhumka earrings with beads dangling all around the edge. I first saw it here on Quilling Me Softly. I was totally amazed – how in the world did Pritesh get those neat and tidy holes all around without damaging the quilling?? I put the question on the back burner as I had a lot of other projects going on. Several months ago someone asked that question on one of the facebook quilling groups. Another quiller commented that you can use a jewelry punch . What in the world was a jewelry punch? Of course I had to google and look it up! A jewelry punch plier is usually used for metal jewelry. Punching holes in metal discs to make pendants, for example. But it is perfect for punching holes in paper jewelry as well! It gives a nice clean edge and is easy to use. As soon as I found out about these jewelry punches, I had to have one! When I visited the US a few months ago I got this one from Amazon. There are actually quite a few brands to choose from. I chose one that had the smallest diameter punch, since it only had to be big enough to fit a wire or jump ring. So I finally took the opportunity to try out the hole punch recently to attempt a style of jhumka similar to the one that Pritesh made. Mine is much more simple, but it has great potential and the technique can be used to make much more amazing and complex designs. So here is a tutorial for you! For a photo tutorial on how to create the rounded part of the earring, click HERE to see my detailed first post on jhumka earrings. Just like that tutorial, I used 5 strips of paper for each earring. You will glue the strips together end to end, and roll it into a solid roll. 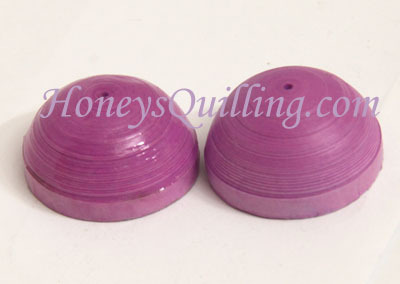 Don’t roll too tightly as it will not mold easily into a 3D shape if it is too tight. Use your fingers, a small sphere object, or a mini mold to push your tight roll into a semi sphere. Spread glue on the inside of the 3D shape and let it dry. Apply a sealant to the outside of your umbrella shape. There are many different sealants you can use. Click here to view all of my posts about particular sealants. For this one I used PPA (perfect paper adhesive). Here you can see what it would look like with glossy PPA, and then with matte PPA. I used matte PPA for this particular pair. Time to punch the holes! I am sure there are many ways to go about getting even holes all around the edge of the jhumka. I tried eye-balling it, but it was not even enough for my liking. So I devised this method. First I wrapped a strip of quilling paper around the base of the jhumka and cut it to the exact length so that it wrapped around once. I laid that piece of paper next to a ruler and saw that it was exactly 7cm long, so I decided to make it easy and do 7 holes! I marked 1cm lengths on the paper. Next I wrapped that paper around the base of the jhumka again and made tiny pen marks on the jhumka to match the marks I made on the paper strip. This was a bit tricky to hold in place. If it slips, just put it back around by matching up the marks you already made. I tried to make the marks right in the middle of that bottom ridge so that I could punch right into the marks and not leave marks on my jhumka. I made another pair of these from another color of paper and ended up having 8 holes on that one since the paper was a tiny bit thicker. So when you place it by the ruler (either cm or inch side) just choose what is easiest for you to mark off in order to have even increments. Time to punch! Here is my hole punch. I preferred the look of having the punch part on the outside. Make a punch at each dot that you made on the bottom edge of your jhumka. Here are the supplies I used to assemble the jhumkas. A headpin, 7 jump rings, 10 little beads, and an earring hook. I used the pliers to help open and close the jump rings and to make the loop at the top of the headpin. Check out THIS POST for a photo tutorial on how to create a loop at the top of the headpin and attach the earwire to it. And here is the finished piece! These are simple, yet elegant and cute, and can be made in all sorts of color combos to match your outfits. I hope you enjoy the paper quilled jhumka earrings tutorial and find it helpful! Feel free to leave any comments or questions, and stick around to view some more great pages here! *The head pins, tiny glass beads and earwires used in this post were sent to me from Panda Hall. All opinions are my own. All other products and supplies in this post I purchased and/or made on my own. Can you tell me the cost of price.Because i want to buy. Hi 🙂 If you click on the link for the jewelry punch plier it’ll take you to Amazon where you can see the price. You can check the price in your local jewelry supply shops as well. nice post. Can you pls tell the size of the plier’s hole. 1/16″ or 1/8″?